A social media startup called Five wants to give us a new way of communicating with our friends that’s more akin to a dinner table conversation than it is to shouting to one another across a crowded restaurant. 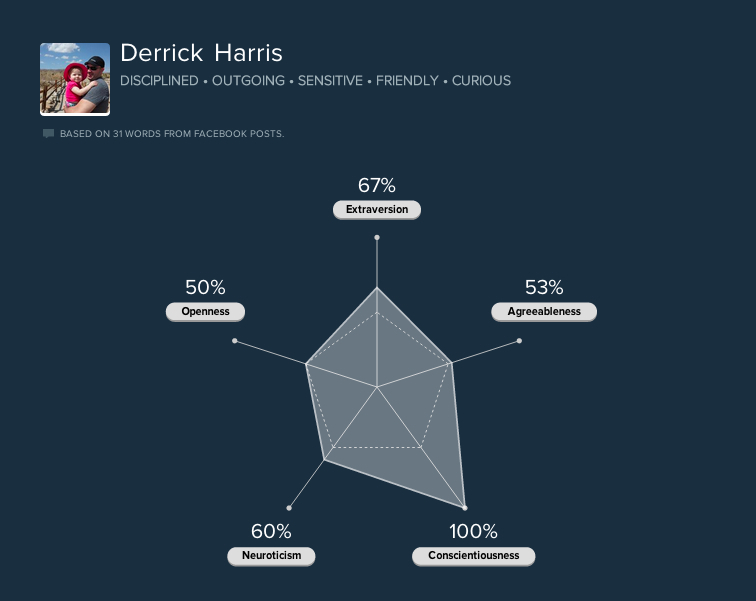 In order to illustrate why it thinks a change is in order, the company has released a tool called Five Labs that analyzes Facebook users’ vocabularies and assigns personality profiles based on them. It’s Five’s way of showing that even though we might be directing most of our social media posts to just a few people, someone else is always listening, taking notes and passing judgment. [company]Five[/company] Labs is based on the World Well-Being Project, a study out of the University of Pennsylvania that correlated the language people use on social media sites (more than 700 million words, phrases and topics) with the results of personality tests they took. When users sign into Five Labs with their [company]Facebook[/company] info, it analyzes their wall posts and their friends’ posts, assigning a five-factor personality profile for each and showing which friends are most similar. These words are associated with conscientiousness. The words negatively associated with the trait are a bit more R-rated. More specifically, he added, Five wanted to highlight something many people might not realize: “It’s now possible to glean data from your social media profile that you never actually provided.” That’s right, our social media activity and online behaviors are more than just collections of data points. They’re all analyzed against various models to classify us and segment us into categories that advertisers can use. For example, when data broker Acxiom tried last year to score some public relations points by showing consumers some of the data it had collected about them, it failed to mention the ways it uses that data to essentially pigeonhole them into a specific demographic profile. Name, age, address, browsing habits — it seems innocent enough until that information gets you classified and marketed to as a something you might not be or might not be proud of being. My minimal Facebook postings suggest I’m more conscientious than Gandhi. A larger sample size might suggest otherwise. I’m not nearly an avid enough social media or messaging app user to speculate on how Five might be different from or better than the myriad other messaging applications that invoke privacy and/or enable private group chat. But I do like its approach to getting out its message that change is needed. It’s like other projects designed to show off how much information we’re emitting every day — think the Human Face of Big Data or the MIT Media Lab’s Immersion tool — but only Five is readying a product it thinks can help stem that tide. Is it possible to get on a mailing list to be kept abreast of these developments? Many of my friends and I are looking for just such a “dinner table” environment. Is it possible to get on a mailing list to be kept abreast of these developments?